On Tuesday, September 16th, Drew Endy presents “The iGEM Revolution“ as part of our monthly Seminars About Long-term Thinking. Each month, our Seminar Primer gives you some background about the speaker, including links to explore even more. Biotechnology is a young science, but it’s already proven its (potential) benefit to civilization. We can now engineer bacteria to manufacture life-saving drugs, we have new ways to diagnose disease, and we know how to modify the genome of plants so they become resistant to certain pests. Yet so far, says Stanford synthetic biologist Drew Endy, biotech has only realized a few of the grand promises it made in the 01970s, after scientists first succeeded in the synthesis of recombinant DNA. How can we realize these promises? How can we make biology easier to engineer? Endy’s answer to these questions is the growing field of synthetic biology, and an open-source, collaborative approach to the development of new bio-engineering tools. 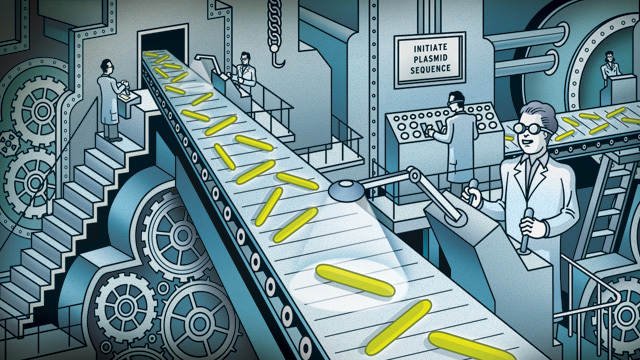 Synthetic biology is built on the technologies of genetic engineering that were developed during the 20th century, but takes them a few steps further. Genetic engineers can isolate blocks of a cell’s genetic material, extract it from its nucleus, and splice it into another cell’s DNA to create a recombinant genome. Synthetic biologists, on the other hand, splice in pieces of DNA that they’ve built from scratch. It’s like the difference between composing an essay by cutting and pasting word sequences from existing texts, or doing so by putting individual letters in sequence in order to create words of your own. No intelligent designer would have put the genomes of living organisms together in the way that evolution has. Some parts overlap, meaning that they cannot change jobs independently of one another. Others have lost their function but have not been removed, so they simply clutter things up. And there is no sense of organization or hierarchy. That is because, unlike an engineer, evolution cannot go back to the drawing board, it can merely play with what already exists. Biologists, who seek merely to understand how life works, accept this. Engineers such as Endy, who wish to change the way it works, do not. They want to start again. Let’s look at biology not as a science, but as a technology platform … Biology is the most compelling technology platform anybody has ever seen. It’s the stuff of life and it’s a reproducing machine! It’s a nanotechnology that actually works. 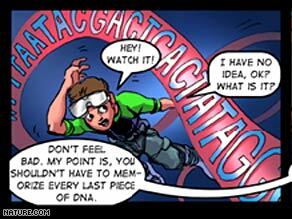 You can program it with DNA – sort of. We’re learning how to do that. It’s the most overwhelmingly cool, impressive technology platform any engineer is ever going to encounter if they’re alive today. Endy’s mission is to help the world learn this new technology – to make biology easier (and thereby faster, more accessible, and finally more productive) to engineer. And in order to do that, Endy identifies two crucial tools. The Industrial Revolution got a serious boost in 1864 when a machinist standardized screws. Henceforth someone trying to build an engine could pluck a standard 8-gauge, 32-threads-per-inch machine screw off the shelf. Endy aims for similar standardization in the new field of synthetic biology, and embraces the radical approach of creating a free registry of building blocks. In 2002 MIT professors started a not-for-profit called BioBricks that has collected 2,000 biological components, including gene sequences that sense light, produce light, send messages between cells and switch cell functions on and off. We can think of BioBricks as the biological equivalent of Legos: they’re pieces of genetic material with universal connectors on each end, so they can be combined with any other piece to create novel strings of DNA. 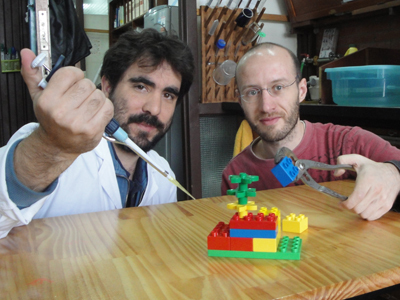 BioBricks make DNA easier to engineer because they create a certain level of abstraction. Rather than having to put the individual As, Cs, T’s and G’s of DNA together when building a synthetic gene, engineers can use BioBricks as a kind of genetic shorthand – just as software programmers make use of languages like Java to spare them the work of writing out their code in bits (Stanford Alumni Magazine). Endy imagines that these BioBricks will be manufactured in so-called BioFabs (International Open Facility Advancing Biotechnology) – a “biological design-build facility.” In fact, he helped launch the first one in Emeryville, in 02009. The idea of facilities dedicated entirely to building BioBricks suggests that standardization also leads to a productive division of labor. In his interview with the Stanford Alumni Magazine, Endy explains, “Separation of design and fabrication can allow people to specialize, becoming experts in each area … We’ve seen this with microprocessors. Someone designs the chip and somebody else builds it.” It’s led to more sophisticated processors – by allowing people to specialize, greater complexity can be developed. Biotechnology today derives investments from business models that support the exclusive application of different biological functions for a very small number of problems. For example, there are wonderful companies that have locked up most of the relevant intellectual property around how to engineer proteins to bind DNA. The products that they can deliver are going to be measured in small positive integer numbers, a few diseases. But, the real value associated with being able to engineer proteins that bind DNA are in the uncountable applications people could use the proteins for. It’s like a programming language where it would be a big downstream economic cost if you owned “if/then” and you were the only person who could use it. Endy considers education a crucial component for fostering this open-source collaboration and innovation. 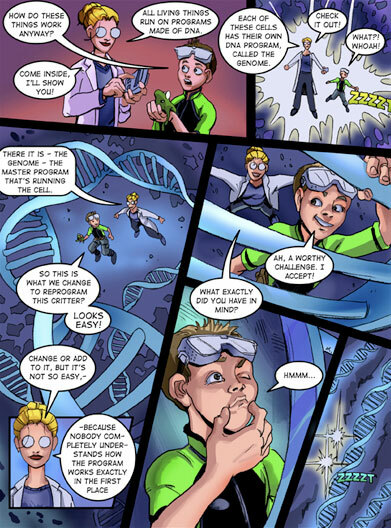 He tries to get high schoolers and college students excited about synthetic biology in several ways – by writing comics about it, for example (and you’ll see several images from his Adventures in Synthetic Biology included in this post). But Endy’s interest in education is truly epitomized by iGEM – the International Genetically Engineered Machines competition. It began as an undergraduate course that Endy developed while teaching at MIT, and has since evolved into a large annual event that draws thousands of participants from all over the world. Competing teams use BioBricks – which they get from and contribute back to the BioBricks Foundation’s Standard Registry of Parts – to engineer synthetic organisms that perform particular functions. The competition not only gets undergraduates excited about the field of bioengineering; its promotion of creative collaboration also spurs innovation and advances new technologies. Of course, the widespread accessibility of new DNA-building tools isn’t entirely risk-free. Critics worry about what kinds of dangerous new things might be built if those standard parts fall into the wrong hands. Endy understands that advances in synthetic biology involve important questions about what new technologies might produce, who will control them, what cultural and ethical implications they’ll hold, and what safety issues may arise. 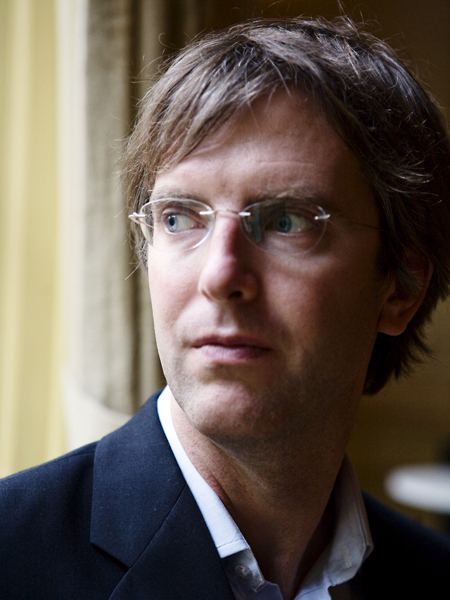 He advocates discussion about these issues: in 02008, The Long Now Foundation hosted a debate between Endy and Jim Thomas, Research Programme Manager at the Action Group on Erosion, Technology, and Concentration (ETC), and an outspoken critic of synthetic biology. Though he sees the value of open discussion about the ethics of bioengineering, Endy hopes we do keep thinking about how synthetic biology might benefit society – and how engineering tools can be leveraged to produce that benefit in an accessible and easy, but also responsible and ethical way. Endy will talk about the promise of synthetic biology, his work with iGEM, and more on Tuesday, September 16 at SFJAZZ Center.